VB.NET being part of powerful of the .NET framework inherits alot of capabilities of modern languages like C#. Most of the libraries and APIs are actually shared. Most of the winform components found in C# can be found in VB.NET as well. One example is ListView which allows us display data in multiple columns. VB.NET ListViews are quite easy to use and efficient. You can build pwoerful management systems with VB.NET when you combine it with a RDBMS(Relational Database Management System) like Microsoft Access. Hence our today’s aim is to perform CRUD operations against MS access database with VB.NET using OleDBData classes. We insert/save data to ms access database from textboxes. We retrieve/select data from the database and bind it to a listview component. We update/edit data. We also delete/remove data row by row. The ListView component allows us display multi-column data in Lists that are very flexible. The class itself belongs to System.Windows.Forms namespace, meaning it’s a winform component. Futhermore, it resides inside the System.Windows.Forms.dll assembly. It’s a component that exists for C#, VB.NET, C++ and F#. Questions this Examples helps answer. How to use VB.NET ListView component with ms access database? How to select/retrieve ms access data to a winform ListView. How to update/edit ms access database via textbox and refresh ListView changes. 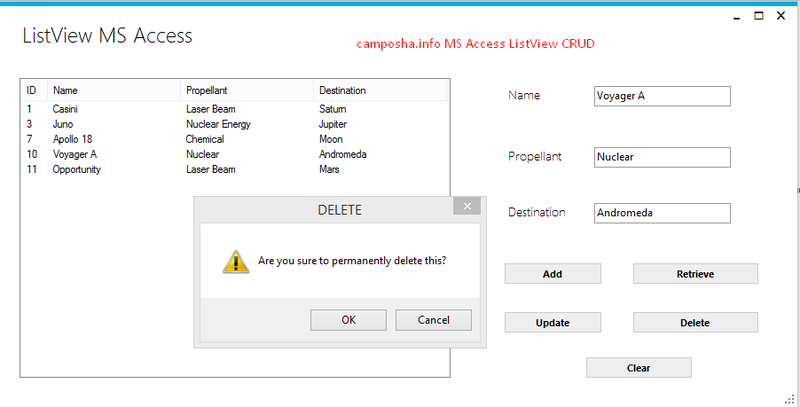 How to delete/remove ms access database data row by row in a ListView. How to set the selected ListView row to corresponding textboxes. How to clear a ListView component on button click. We assume that you can drag a ListView component in visual studio onto your winforms. Note that We used metro theme to theme our winforms. You don’t have to do so. However, if you would want to install metro theme look at this link in youtube. For this project, simply extend the System.Windows.Form instead of MetroForm. We also assume that you ms office access software installed in your machine and can create a database project in it with three 4 columns as shown below. Below is the overview of our MS Access database table. Below are our columns with database data types. We have attached the MS Access database with the project, it’s in the mdb format. Just copy it to some directory and then copy the path of the mdb file you’ll use it in the connection string. This is where we INSERT,SELECT,UPDATE,DELETE data to and from MS Access database. Private Const conString As String = "Provider=Microsoft.Jet.OLEDB.4.0;Data Source=C:/Users/Hp/Documents/DataBases/spacecraftsDB.mdb;"
Const SQL As String = "INSERT INTO spacecraftsTB(S_Name,S_Propellant,S_Destination) VALUES(@NAME,@PROPELLANT,@DESTINATION)"
Dim sql As String = "SELECT * FROM spacecraftsTB "
Dim sql As String = "UPDATE spacecraftsTB SET S_Name='" + spacecraft + "',S_Propellant='" + propellant + "',S_Destination='" + destination + "' WHERE ID=" + id + ""
Dim sql As String = "DELETE FROM spacecraftsTB WHERE ID=" + id + ""
Download the source code above. In your Visual Studio: File -> Open ->Project/Solution. That’s it, you’ve imported the project to your visual studio. Drag Drop a datagridview in your Form in visual studio. Copy the Form1 class above into your Form1. Change the connection string path. We’ve seen how to insert, select, update and delete data to and from microsoft access database using vb.net. Our component is ListView.